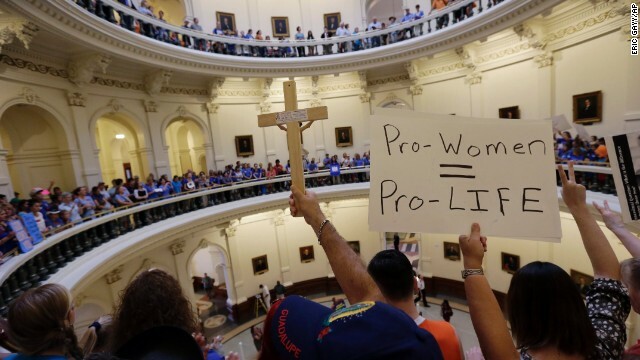 The language of the resolution, provided to CNN by Barrosse, cites polling data showing majority opposition to late-term abortions and support for parental consent laws. "The Republican National Committee urges all Republican pro-life candidates, consultants, and other national Republican Political Action Committees to reject a strategy of silence on the abortion issue when candidates are attacked with 'war on women' rhetoric," the resolution reads. Barrosse said she wrote the resolution, in part, because GOP candidates like presidential nominee Mitt Romney and Virginia gubernatorial candidate Ken Cuccinelli failed to defend themselves against a barrage of "war on women" attacks unleashed by Democrats in 2012 and 2013. She said Republicans who oppose abortion have an obligation to confront the hot button issue during their campaigns, rather than hope it disappears. "Not talking about it has not worked well for us," Barrosse told CNN in an interview. "Not responding has not worked well for us. It's a conversation the party has to have." The 168-member RNC is gathering this week in Washington to huddle on party strategy and vote on a series of rules changes that will affect the 2016 presidential nomination process, proposals that were reported by CNN last year. The meeting also happens to coincide with the annual March for Life, an anti-abortion demonstration that some RNC members, including party chairman Reince Priebus, are expected to join. The new abortion language will be introduced Wednesday at a session of the RNC's resolutions committee, and may face some changes before it moves on to the full committee for a Friday vote. Asked about the resolution, RNC spokeswoman Kirsten Kukowski called it "one of the first steps for the GOP to start taking back messaging on this false war on women." "It provides guidance on messaging, on how to do that, and how we can positively promote our social agenda using facts," she said. RESOLVED, The Republican National Committee urges all Republican pro-life candidates, consultants, and other national Republican Political Action Committees to reject a strategy of silence on the abortion issue when candidates are attacked with "war on women" rhetoric. Polls on this issue are very misleading. If a polls asks respondents, "Do you support abortion?" a lot of responders will answer "no" because nobody is actually pro-abortion. On the other hand, if the poll asks "Do you think that abortion should be legal", most people will answer "yes" because they believe women should have control over this issue rather than government. The bottom line is, this issue has already been litigated - more than 35 years ago. Abortion is legal and there are controls in place which already limit that right. This issue has been used as nothing more than a political tool to incite the conservative base and the agenda behind it has very little to do with morality. It's much more about winning elections at any cost. >"It provides guidance on messaging, on how to do that, and how we can positively promote our social agenda using facts,"
It's not a human being until the mother says it is, be that conception of junior in high school. I thought this whole abortion deal was settled by the Supreme Court about 40 years ago. It never seems to end. when exactly is it that a zygote becomes a fetus that becomes an "unborn baby".. But it's OK to go out and drown the extra puppies/kittens when ya don't want them.. Bwah!